This years’s 50th anniversary Ballina Salmon Festival will have the added attraction of a bumper Ballina Heritage edition of the Western People. The edition carries dozens of Western People pictures of festival goers down through the years. It also carries an interview with Ballycastle’s John Tony Mor from 1964. He remembers fondly the ’98s Mayo team – every man over six feet – who beat all before them back on ’08 (1908). There’s also an extensive memoir from Stephen Donnelly reprinted from the 1960s where he tells in great detail what happened in the build up and during the War of Independence in Ballina and the part he played in it. 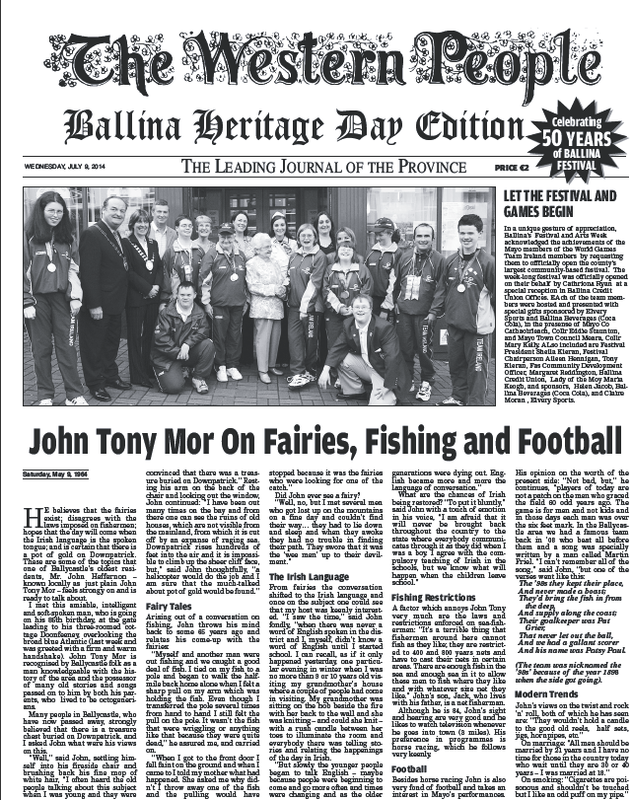 So watch out for the Ballina Heritage edition when you visit Ballina for the Salmon Festival this week. It’s not to be missed.